The old adage - if it ain't broke, don't fix it - rightly portrays Indian consumers' scepticism about Windows 7, the three-month-old operating system from Microsoft. Take the example of Aditya Thakore, an animation designer with a Hyderabad-based multimedia and design studio. Thakore is your quintessential Indian consumer who uses a computer for "basic browsing and office work." He bought his laptop eight months ago, pre-loaded with Windows Vista. Despite hearing good things about the Win 7 OS, he is not too keen to upgrade. "It won't make any difference to my usage, will it," he asks. The situation is slightly better in the case of Arvind Nigam, chief executive officer of Noida-based tech firm Lattice Purple. 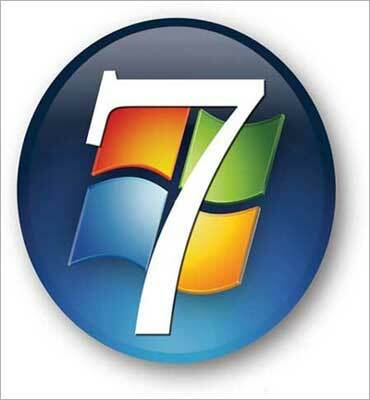 An open source user, Nigam is keen to give Win 7 a try. But he is also in tune with the general feeling among consumers. "Unless a new machine is bought, people are lethargic about switching OSes," he says. Of course, Microsoft India Director (Consumer & Online Business) Rajiv Popli can argue at length against these viewpoints. In the consumer segment, Windows has a dominant footprint in the 40-million installed base in the country. "Already, sales of Win 7 are six times what we witnessed across retail stores for our earlier software," asserts Popli. 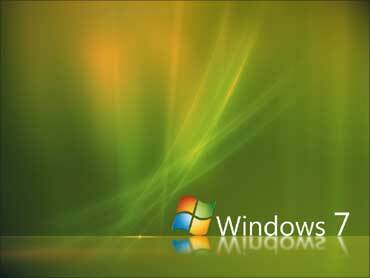 Analysts, too, argue that Windows 7 is driving a healthy uptake in PC demand. But what they say next gives the game away. The spike in sales of Win 7 has been mostly buttressed by an installed base of ageing PCs and delayed upgrade cycles (nearly 80 per cent of installed PCs still run Win XP or older OS versions). 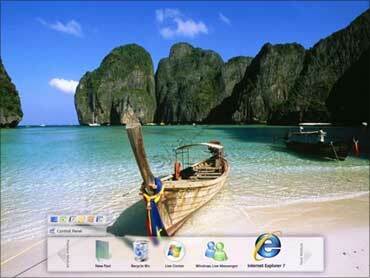 In fact, according to industry estimates, Windows XP and Windows Vista are found on 90 per cent of the PCs in India. Other OSes from Apple and open source software command just 10 per cent of the market share. What has also helped is the improved consumer confidence in Microsoft's latest OS compared with the reception its predecessor Vista got. "There's this curiosity factor around it and, performance-wise, it is said to be better than Vista. Consumers are no longer asking for the older Win XP with new purchases," says a sales manager from Hewlett-Packard. Trouble is, not all are willing to pay for original software. Win 7, which launched just three months ago, has quickly made its way into the grey market too. The OS is officially sold in India in the price range of Rs 6,000 to Rs 11,000. That's a price level many still find too high, even though it is strategically lower than Win Vista, which was priced between Rs 7,500 and Rs 22,700. According to reports, 50,000 pirated DVDs of Windows 7 were sold in India right from the day of the official launch on October 22, 2009, generating an unaccounted business of around Rs 50 lakh (Rs 5 million). When contacted, a grey market vendor in New Delhi's Palika Bazaar claimed that he had sold hundreds of copies of Win 7, priced between Rs 800 and Rs 2,000, since its launch. Vijay Mukhi, a Mumbai-based cyber security consultant, says the grey market has had both a positive and a negative impact on Win 7. "While sales would have been hit, the word of mouth publicity about Win 7 has been pretty good," he says. Users like Paritosh Deb, a senior healthcare professional with Max Hospitals, feel an upgrade to Win 7 is a natural curve. "I switched from Win Vista Home Premium to Win 7 after I saw that the new OS had an XP mode that could run older PC applications." Deb claims that the upgrade, which he did online, was a painless process. "The fact that I don't have any technical know-how about computers was no restraint. I had to only click some buttons," he says. But, even with over 2,000 businesses switching over to Microsoft's latest operating system, Windows XP continues to reign on PCs across the country. Consumers like Nigam feel that spending Rs 6,000 for a new OS, over and above the price of the hardware, can be one reason why people opt for a cheaper pirated copy. He cites another factor too. "Forget lethargy or price," reasons Nigam, "it is actually resistance to change that has impaired the spread of Win 7."